A way to read text messages just by touch has been developed by researchers in Germany. They created a mobile with tiny arrays embedded with moving pins that rise and fall under a person's fingertips. 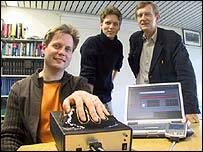 This allows a person to perceive a text message as a 'tactile melody', said the scientists from Bonn University. 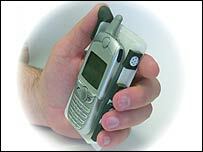 They have shown off a working prototype of the phone at this week's Hanover industrial trade fair. 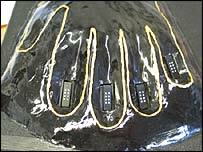 The researchers came up with a way to direct the movement of the pins to create specific patterns under the fingers. While the system can to recognise circles, lines, squares, or letters such as V, the perception of more complex symbols is highly individual. For instance, the '@' sign might feel like a spiral, the word 'I' as a wave that flows towards the person and 'you' as a wave that flows away. "Of course, we are not intending to transmit letters via this tactile channel," said Professor Rolf Eckmiller, head of the Division of Neural Computation at Bonn University. "We are not about to compete with the eye. What interests us is the rapid transmission of sensory units, such as I, you, in an hour or to Bonn. "So it would be possible, for instance, given an appropriately equipped mobile, to translate the SMS sentence, 'I shall be home in an hour' into a corresponding sequence of tactile melodies," he said. Future users of tactile mobiles are not expected to spend ages though, memorising preset fingertip melodies. The group is working on specially designed software that will enable the device to adapt to its owners and give them the option of creating their very own touch vocabulary. By providing the user with a selection of tactile terms for each word they wish to use, the software will be able to create further variations till the word is transformed into satisfactory pin movements. The researchers say that the system can be quickly taught to identify the melody the individual wants to correlate with an object, word, or event which a person can then remember just as easily as they would remember pictures and sounds. "I can assign a certain tactile melody to my wife and another tactile melody to my daughter," said Prof Eckmiller. "If they send me an SMS, I immediately recognise these melodies, because I selected and generated them myself." Benefits include being able to read messages with total privacy or under poor lighting conditions. The team has been working on the technology for four years and has filed patents a year and a half ago. The scientists expect the system to pave the way for purely tactile SMS messaging in future generations of mobiles but the technology has many potential applications. For instance, tactile actuator arrays built into steering wheels or control handles could provide car drivers or pilots with information as to the right route or warn them in difficult situations. Pieces of art could be developed solely to be touched, by 'tactile composers' akin to music for the ear and paintings for the eye. The scientists are also looking to apply the process in the field of medical engineering, to reproduce sounds for the deaf, or as a visual aid for the blind. "Our major intention with this invention and development is to open up the sense of touch as a new channel for human communication," said Prof Eckmiller. "The sense of touch will in the future be added as the third communication channel to human communication technologies."